Federal Champion .22 Long Rifle ammunition is an ideal choice for the high-volume shooter looking for quality rimfire ammunition. 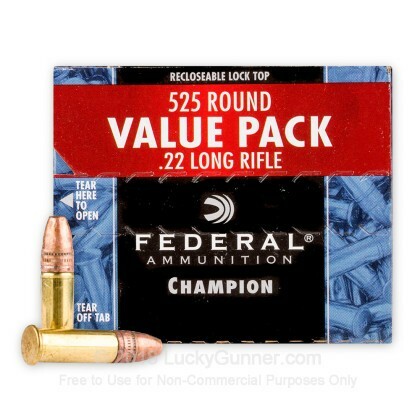 This 525-round bulk pack makes for an inexpensive day plinking or target shooting at the range and is also an effective varmint and small game round. 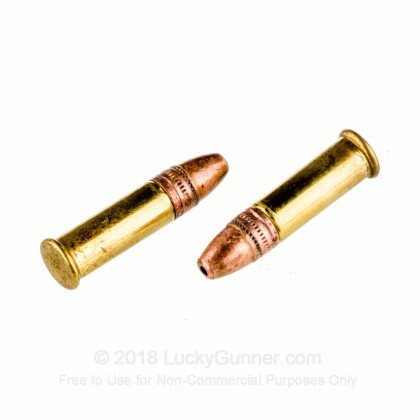 Each round contains a 36-grain, copper-plated hollow point projectile loaded into a rimfire primed brass casing that is non-corrosive. These high velocity rounds are capable of a muzzle velocity of 1260 FPS and deliver an economical and high performing option. Federal, based in Anoka, Minnesota, has become one of the world’s premier ammunition manufacturers. For nearly 100 years, Federal continues to produce high quality, American-made ammunition, while innovating new designs for hunting, self-defense and target shooting. Excellent range ammo for my M&P 22 Compact! Newer shooter here, so take that as you may. Shot Remington Thunderbolt before this, and it was mediocre at best. Bullets falling out of the case, FTE due to weaker shots, etc. Happy to report that is NOT the case with these! My M&P 22 Compact loves these things, and it's a ton of fun. Lucky Gunner is my only source of ammo because of their amazing YouTube channel, blog, and most of all, fast and thoughtful shipping! I have shot alot of this over the years. It's good stuff, Works in my rifles and pistols and have nearly no trouble to complain of. Great performance and price...I'm very satisfied! Was very happy to find 22lr ammo! Grateful to get the ammo. You delivered quickly and so far no misfires out of the 250 rounds I used. It's a great product that works good in my ar ccmg conversion kit. Arrived quickly and in good condition. Great price and service. 500 rounds and no FTF or FTE I'm good. copper deposits in the barrel, yes. what do you expect when you shoot several hundred at one range time, but still no problems with the product. Could I have gotten these for less, maybe, if you can find them. I'm not going to camp out at loading docks to get them straight off the truck. seems that's the only way to get them locally unless you have an insider. The rounds were reasonably priced with super fast delivery. This was my 5th purchase so far and all 5 have been fantastic. I ran 300 rounds through my Henry AR-7 Survival Rifle with no issues. Great price and shoots good in my M&P 22. It works great in my ak47 22 or rifle. So far no problems. Thanks LuckyGunner for a great product and a great price. This is one of the least expensive .22lr cartridges I could find, and it runs flawlessly through my S&W M&P 15-22. 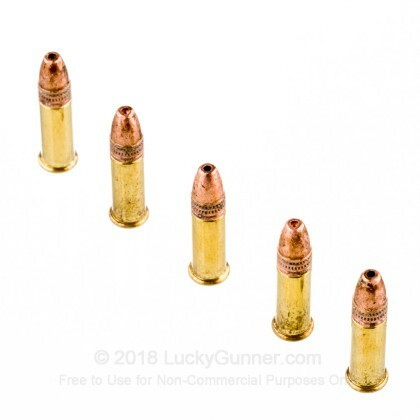 It's easy to load into magazines, no failures to feed, no failures to fire, no failures to eject, and this was as accurate as the Gold Medal Match and Gold Medal Target ammo - at half the cost. This is now my .22lr ammo of choice for almost all applications (except perhaps competition), and one of the best bargains out there. Happy with this round, no malfunctions, and it groups surprisingly good at 25 yds. Decently accurate out of a Ruger 10/22 with peep sights and a Ruger 22/45 target pistol. Fewer duds and extraction problems than the other brands of bulk pack .22 LR. Kind of dirty, but then .22 LR normally is and I don't know of any that's very clean. This stuff is great, quality and hollowpoints which is a plus if you are trying to make targets react. Looks much better than most .22 ammo and I think fires fairly clean. If you want to compare it to something it is much better than the Remington gold bullet. Can't go wrong with a price like this. Keep the good deals coming. For a good price, this is excellent ammo. It works great in my finicky AR-7 (the U.S. Survival Rifle needs a good, strong high-velocity round to cycle cleanly), firing accurately and without an FTF in over 100 rounds. After some cheap Remington 1-3% FTF rate, this was impressive. It's about as dirty as average, but not especially so. Broke in a new Ruger SR22p and no problems. Good groups and no failure to feed or eject. Great value for the grand kids to practice. 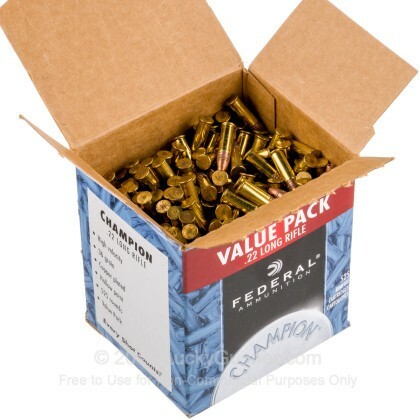 This is great ammo at a great price. I have used a lot of this ammo and never have had a misfire. LuckyGunner always has great prices and their fast shipping can not be beat. Good ammo for target practice, fire well. Have put thousands of rounds of this ammo through my CZ452 and it never one misfire or jam. Decent groups at 200 and 300 yards. Good ammo shot a couple hundred rounds from my browning, all solid and on the mark. federal 22lr ammo does not have enough power to operate my 22 pistol, every single shot is a stovepipe or FTE/FTF, I was puzzled by it, and then checked internet forums, everyone that had the same problem with federal 22lr switched to CCI blazer and the problem went away, and I did the same thing, fixed all my problems. Don't waste your money on federal 22lr, buy CCI blazer instead. Pros: Probably the best there is for the price. Great value, none out the box failed to fire, tight groups, no jams, won't gunk up your gun like CCI's will. Cons: These seem to be slightly less powerful than the Remington "Value pack". I fired dozens of these through my GSG 522SD with no FTF or FTEs. highly recommended, reliable nail-driver rounds! As Usual.. It is great.. It just works... Now go out and shoot..
Service from order to receipt was first rate! Great value, works well on bunnies and never any misfires or problems. Will buy lot more! My Ruger 22/45 ate 2 boxes, no hiccups at all. Shipping was extraordinary - Ordered on Tuesday night, was here on Thursday morning. Keep up the excellent service! Best value for the Buck! My Ruger MKIII 'Hunter" loves the ammo!! I AM VERY PLEASED WITH MY PURCHASE . QUALITY PERFORMANCE AND SERVICE IS GREAT. VERY HAPPY WITH LUCKY GUNNER IN FACT I AM ADVISING ALL MY FRIENDS ABOUT THEM. I am very satisfied with the ammunition. I have used it in my Ruger Mark I and my Ruger single six in target shooting. It works well in both firearms, and the price is hard to beat. The bang for the buck!! Bought some of this stuff about 3 weeks ago. And only had a couple misfires but that is to be expected with rimfire. Shoots straight and always on target. Just about to buy some more. And lucky gunner is the best spot to feed the sickness. For the money thay shoot well .Ihave shot over a 1000 rds to date and only two that did no go off. Full 525 rounds thru a Walther P22 without a FTF, missfeed, or jam. Just ordered more. Great service from Lucky Gunner. Fired 100 rnds thru a notoriously finicky Walther p22. Not a hitch. I had read this ammo wouldn't work well in this gun. Bull. Worked perfectly. I bought these bullets for my Ruger 10/22. great .22s no jams, no feeding problems, and firing them was pretty great up to 25yrds. 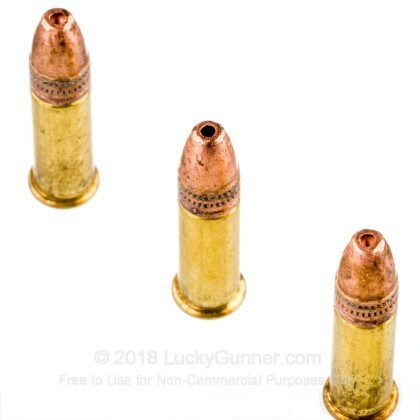 Can't beat .22LR for bang for the buck when it comes to plinking and I found the best price on luckygunner.com. Thanks. Have shot 200 of these through my High Standard Sport King without a hiccup. Of course my gun usually performs well with any Ammo!! Love my SK-100 High Standard! 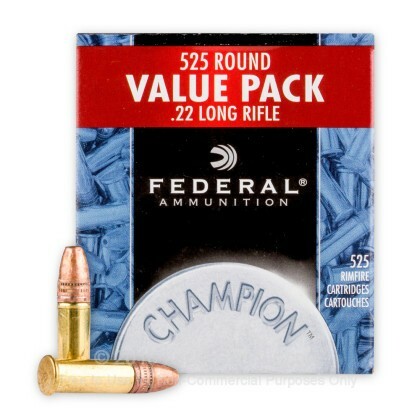 We also have this 22 LR - 36 gr CPHP - Federal Champion - 5250 Rounds ammo in stock in a bigger quantity.